Londonderry's 115th annual Old Home Days Celebration will be held August 13 - 17th this year. Wednesday the 13th is the 8th annual Senior Night, with a an old fashioned cookout at the Lion's Hall pavillion followed by a concert on the common by the Windham Swing Band. Thursday the 14th is the popular Kids Night with activity tables by local youth organizations, entertainment starting at 5:30 until 8pm, snacks, and loads of fun. Following Kids Night will be the Movie Mania with movies for ages 12 and up starting at 9pm. Friday the 15th is the annual Police vs Firefighters softball game at the Matthew Thornton School field at 6pm followed by a concert and fireworks. The big day is Saturday, August 16th, starting at 8am with the 5k footrace. You can participate or watch starting on Mammoth Road at the Grange Hall, south to Peabody Row, onto Buttrick Road and back to the Grange Hall for the finish. Registration starts at 6:45 at the High School. Following this is the parade at 10:30 rain or shine, starting at the high school, following Mammoth Road to Mack's Apples. Following the parade there are events at two venues. First is the Londonderry Historical Society Museum complex on Pillsbury Road. There will be tours of the Morrison House, the barn, the blacksmith shop and the newly erected carriage shed by members of the Historical Society. Also on the grounds will be the colonial re-enactors encampment and militia. 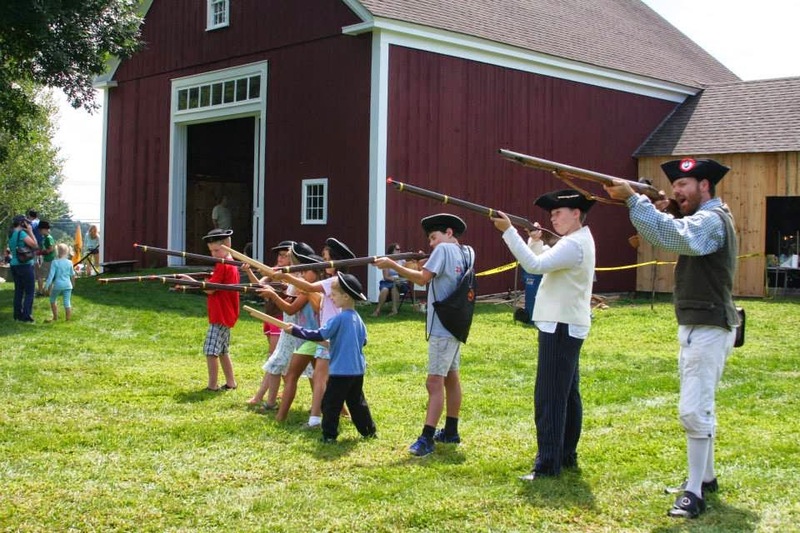 They will be shooting off cannons, drilling the children, and demonstrating colonial era cooking and crafts. There will be a farmer's market, crafts booths, food, music and children's games. Just a short walk up Pillsbury road to the town common and you will find the booths sponsored by local organizations and businesses featuring food, drinks, games and activities. The bandstand will have entertainment all afternoon with Londonderry Sings and Applestock, and the Lions will have their annual barbecue. Sunday August 17th will be an ecumenical church service on the common, followed by a picnic and a Christian Concert. In case of rain, this event will take place in the Matthew Thornton School gym. Weathervane Wednesday is an on-going series of photographs I post weekly. I started by publishing weather vanes from the Londonderry area, but now I've been finding interesting weather vanes all across New England. Sometimes my weather vanes are whimsical, or historical, but all are interesting. Often, my readers tip me off to some very unique and unusual weather vanes, too! Today's weather vane is from Salem, New Hampshire. Do you know the location of weather vane #167? Scroll down to the bottom to see the answer! Today's weather vane was spotted on the corner of Main Street and South Policy Road in Salem, New Hampshire. It's not far from Exit 2 of Route 93. This is a business that deals in private charters for passengers and cargo, so the antique bi-plane weather vane fits right into their aviation theme. It is a three dimensional weather vane, with lots of detail. You can even see a tiny propeller in front of the nose of the plane. Although this is a fairly new business, and the the weather vane is not very old, it has a great patina. Click here to see the entire collection of Weathervane Wednesday posts! An Ulster History Circle blue plaque is to be erected in Aghadowey, Co Londonderry, on July 28 to the Rev James MacGregor, a Presbyterian minister who led a convoy of Ulster Presbyterians from the Bann Valley region to America in 1718. MacGregor, from Magilligan and who fought alongside his father at the Siege of Londonderry, was instrumental in the establishment of the Scots-Irish township of Londonderry in New Hampshire. As well as their strong Presbyterian faith, the Bann Valley Presbyterians brought Irish potatoes to the American colonies, cultivating the crop at Nutfield, over a 144-square mile wilderness they had been given by the colonial authorities. The MacGregor Presbyterians, who sailed from Londonderry to Boston, came from congregations in the Coleraine, Aghadowey, Macosquin, Garvagh and Ballymoney area. The blue plaque ceremony on the night of July 28 will be conducted by Gregory S Burton, the US Consul General for Northern Ireland, and by Aghadowey Presbyterian minister, the Rev Robert Kane. The blue plaque has been organised by the Ulster History Circle together with the Ulster Scots-Agency. Chris Spur, chairman of the Ulster History Circle, said: “James MacGregor was a man who saw and made history. “In the Siege of 1689, he is believed to have signalled the relief of Derry; in 1718 he led the great Migration and in 1722 he founded Londonderry. 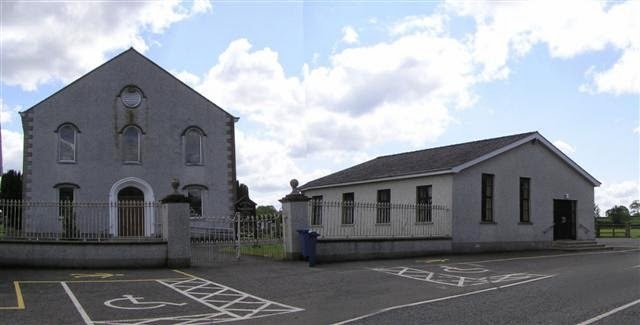 A Presbyterian minister dubbed the ‘Moses of the Scotch-Irish’ has been honoured at his former church in Co Londonderry with a Blue Plaque. James McGregor was born in Tamlaghtard near Magilligan Point in 1677 and ordained as the clergyman at Aghadowey in 1701. He preached in the Irish language for many years but in 1718 - when the effects of the religious persecution of non-Anglicans, bad harvests and soaring rents caused great hardship - he led up to 1,000 immigrants on to five ships bound for Boston, America. The new arrivals were not welcomed by the English settlers already there so Rev McGregor led his flock to Nutfield, New Hampshire where they founded the first Ulster Presbyterian settlement on the continent. The plaque commemorating the achievements of the pioneering minister was unveiled yesterday at Aghadowey Presbyterian by the US Consul General for Northern Ireland, Gregory S Burton, and the current clergyman Rev Robert Kane. Rev McGregor is reputed to have brought the potato to America where it was cultivated by the new settlers and, having put down roots at Nutfield, the Ulster-born congregation members were granted permission in 1722 to change the town’s name to Londonderry. The Blue Plaque tribute is the result of collaboration between the Ulster History Circle and the Ulster-Scots Agency. Ulster History Circle chairman Chris Spur described James McGregor as a “man who saw and made history”. US Secretary of State John Kerry, who ran against George W Bush for the presidency in 2004, is a descendant of Rev McGregor. The Massachusetts senator, on his mother’s side of the family, is a 6th great grandson of the renowned clergyman with a sense of adventure. To date, the Ulster History Circle - which is funded by donations from individuals and various organisations - has erected a total of 178 Blue Plaques across every county in Northern Ireland. “Blue Plaques” are signs installed all over the United Kingdom and internationally to mark historical spots important in British history. There are some in Paris, Dublin, Australia, Canada and the United States. They were first introduced by the Royal Society of Arts in 1867 when a plaque was installed to commemorate Lord Byron’s birthplace. These plaques are similar to the historical markers you can see in the United States by the National Register of Historic Places or other governmental agencies. 16 May 2013 "Celebration in Northern Ireland"
27 Sept. 2012 "Aghadowey Session Book at NEHGS"
8 July 2012 "Nutfield is the scene of a BBC documentary"
1 Sept. 2011 "Original Nutfield Proprietors, 11 April 1719"
21 Dec. 2010 "Tombstone Tuesday - Rev. James and Mary MacGregor of Londonderry"
Heather Wilkinson Rojo, "Aghadowey, Northern Ireland Celebrates “The Moses of the Scots Irish” , Reverend James McGregor", Nutfield Genealogy, posted July 29, 2014, ( https://nutfieldgenealogy.blogspot.com/2014/07/aghadowey-northern-ireland-celebrates.html: accessed [access date]). This memorial was photographed at the Mount Auburn Cemetery in Cambridge, Massachusetts. The canopy above the urn is carved with the words FAITH, HOPE, CHARITY and JUSTICE. There is a large dog symbolizing fidelity below the epitaph, and the other sides show carriers delivering packages. William Frederick Harden was born 23 August 1812 in Reading, Massachusetts and died 14 January 1845 in Boston, Massachusetts. He founded Harden & Co., one of the first express companies in the the United States. He was the first person to send express packages by rail, and had trans-Atlantic service to many European cities by ship. He died bankrupt in 1845 when his health failed and he could not keep up his service. Harnden's business was the forerunner of modern express companies like UPS and FedEx. This monument was erected in 1866 by "the express companies of the United States" in his honor. You can read all about Harnden and his express company in the book History of the Express Business, including the origin of the railway system in America, and the relation of both to the increase of new settlements and the prosperity of cities in the United States, by A. L. Stimson, New York: Baker & Godwin, Printers, 1881. This book is available to read online at archive.org. Or the book William Frederick Harnden: Founder of the Express Business in America! by Alfred L. Hammell, Kessinger Publishing Reprints, 2010, a new release of the 1954 original. August 1 – 10, Salem Heritage Days, Salem, Massachusetts, at the Old Town Hall, 32 Derby Square, food, fun, activities for all ages including the Essex Street Fair, the Ice Cream Bowl, and a car show on Chestnut Street. August 2nd is the Salem Maritime Festival hosted by the National Park Service with live music, historical re-enactors, tall ships and interactive programs. 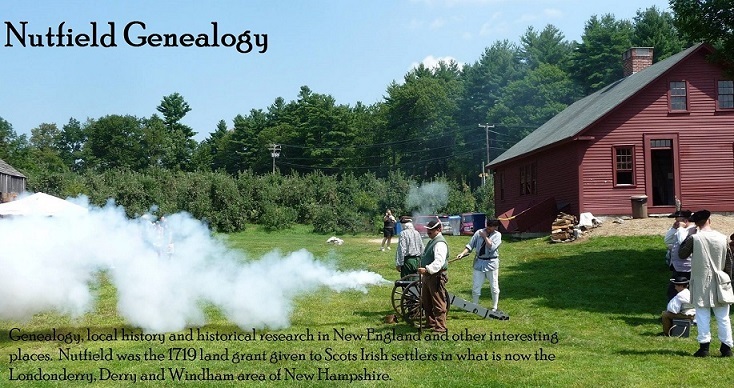 August 2, Saturday, 9am – 4:30pm, NEHGS Family History Day 2014, at the University of Massachusetts, Amherst campus, One day workshop by the experts at the New England Historical Genealogical Society to show you the best practices in genealogy. Sponsored by MyHeritage. Click here for more information and registration https://regstg.com/Registration/Introduction.aspx?rid=0aa22e42-d991-48ab-bd5c-68e504e3e206 $40 per person by July 18th, after July 18th $80 per person. Optional lunch $18 per person. One on one consultations with NEHGS genealogists available (25 minutes) for $30 per person. August 2, Saturday 17th Century Saturday at the Whipple House in Ipswich, Massachusetts. FREE tours of the 1677 Whipple House and the authentic reproduction 1657 Knight House. Demonstrations of spinning and weaving on the Whipple House lawn. August 3, noon, Vintage Baseball Doubleheader, Newburyport Clamdiggers vs. Portsmouth Rockinghams, at the Spencer-Peirce Little Farm, 5 Little’s Lane, Newbury, Massachusetts. Watch two games play baseball with 1860s rules. Grass field seating, bring blankets and lawn chairs, no reserved seating. Weather permitting, please call 978-462-2634 for more information. Free to Historic New England members, $5 non-members. August 7, Thursday, noon, Lunch & Learn, Visual Images of Metacomet after King Philip’s War, at Plimoth Plantation, Plymouth, Massachusetts. Bring your lunch, or buy one in the visitor center, and listen to a presentation by Joyce Rain Anderson. Free to members, $8 non-members. August 9, Saturday 11am – 1pm, Beacon Hill Walking Tour, Otis House, 141 Cambridge Street, Boston, Massachusetts $6 Historic New England members, $12 non-members. Registration required 617-994-5920. August 12, Tuesday, reception at 5:30, lecture at 6:15pm Twilight Talks- Chronicles of Old Boston, at the Otis House, 141 Cambridge Street, Boston, Massachusetts, $10 Historic New England members and Victorian Society members, $12 non-members. Registration required call 617-994-5920. August 13, Wednesday, 5 – 6pm, Appleton’s Jackson House, at the Jackson House, 76 Northwest Street, Portsmouth, New Hampshire, Free to Historic New England members, $10 non-members. A special tour of the 1664 Jackson House, focusing on William Sumner Appleton’s 1924 restoration. Light refreshments in the orchard. Registration required 603-436-3205. August 17, Sunday, 2:30 – 4:30 Afternoon Tea, at Beauport, The Sleeper-McCann House, 75 Eastern Point Boulevard, Gloucester, Massachusetts, $25 Historic New England members, $35 non-members, an elegant tea on the terrace overlooking Gloucester harbor, with tea sandwiches and music. Sunhats recommended. Rain or Shine. Registration required 978-283-0800. August 29 – 31st, 30th Annual Gloucester Schooner Festival, at Gloucester, Massachusetts in the harbor and nearby. http://gloucesterschoonerfestival.net/ Fireworks on the 30th, parade of sail on the 31st. September 4, Thursday, noon, Lunch & Learn: The Restoration and Re-Launch of the Whaling Ship Charles W. Morgan, at Plimoth Plantation, Plymouth, Massachusetts. Bring a lunch, or buy one in the visitor center, and listen to Dr. Elysa Engelman of the Mystic Seaport speak about the whaling ship Charles W. Morgan, originally launched in 1841. Free to members, non-members $8. September 6, Saturday, 11am – 3pm Jackson Hill Cider Day, at the Jackson House, 76 Northwest Street, Portsmouth, NH. Free to Historic New England members, $6 non-members, $3 children. Held grind apples and press cider. Watch artisans demonstrations, children’s games, crafts and seasonal refreshments, too. Tour the 1664 Jackson House. Call 603-436-3206 for more information. September 7, Sunday, noon, Vintage Baseball Double-Header, Lynn Live Oaks vs Newburyport Clamdiggers, at the Spencer-Peirce Little Farm, 5 Little’s Lane, Newbury, Massachusetts. Watch two games play baseball with 1860s rules. Grass field seating, bring blankets and lawn chairs, no reserved seating. Weather permitting, please call 978-462-2634 for more information. Free to Historic New England members, $5 non-members. September 11, Thursday, 2:30 – 4:30pm Capturing Beauport, at the Sleeper-McCann House, 75 Eastern Point Boulevard, Gloucester, Massachusetts. $25 Historic New England members, $50 non-members. Have you ever wanted to take photos of Beauport’s interior? Now is your chance for a regular tour with extra time for photography. There is also a chance your favorite image will be chosen to be made into a postcard for sale in the museum shop. Registration required 978-283-0880. September 14, Vintage Baseball Double Header, Lowell Baseball Club vs. Portsmouth Rockinghams, at the Spencer-Peirce Little Farm, 5 Little’s Lane, Newbury, Massachusetts. Watch two games play baseball with 1860s rules. Grass field seating, bring blankets and lawn chairs, no reserved seating. Weather permitting, please call 978-462-2634 for more information. Free to Historic New England members, $5 non-members. October 1 – 31st, 33rd Annual Salem Haunted Happenings, all over Salem, Massachusetts, see the website http://hauntedhappenings.org/ Grand Parade, Street Fairs, Family Film nights, costume balls, ghost tours, haunted houses, live music and theatrical presentations. Happy 5th Blogoversary to Me! I started this blog on July 27, 2009 with a story about my brickwall Hawaiian cousins. At first I was writing genealogy stories only for my family, but I slowly gained readers over the first year. Since then I have written almost 1650 posts, and have been read more than 850,000 times. Last November "Nutfield Genealogy" had 38,517 page views in one month, according to the statistics on my Blogger page, an all time high for me. This is a big THANK YOU to all my blog readers and blog followers. Thanks for all your wonderful comments and collaborations. THANK YOU also to all my guest bloggers, most of whom have gone on to start their own wonderful genealogy blogs. 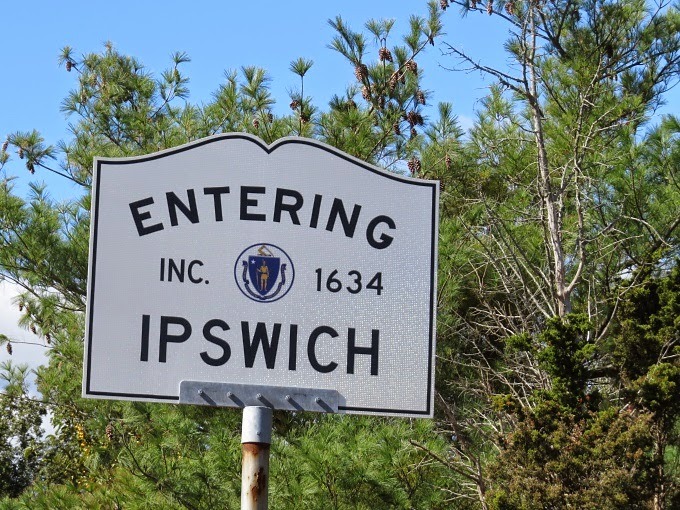 There were two Thomas Wells living in Ipswich, Massachusetts at about the same time. No kinship has been proven to the other Thomas Wells who married Naomi Marshall. No kinship has been proven to the Dr. Richard Wells, living at the same time nearby in Salem, Massachusetts (although an early NEHGS Register article Volume 4, pages 11 and 12 name Thomas Wells of Ipswich as a “physician” because he left a “physicke” book to his son in his will. This error was repeated in Joseph B. Felt’s book History of Ipswich, Essex and Hamilton, 1834). There was also a woman named Ann Wells, age 20, who arrived with Thomas Wells on the same ship but according to genealogist Robert Charles Anderson, there is no kinship connection. Thomas Wells arrived in the New World aboard the Susan & Ellen in 1635, aged 30. He was made a freeman in Ipswich, Massachusetts on 17 May 1637. He appears in many town records, as juror and constable, and as a land owner. He was a member of the Ancient and Honorable Artillery Company in 1644. His lengthy will named his wife and all his children. He owned many books and maps, and he signed his own name. His wife, Abigail, also left a will dated 22 July 1671, which included many goods, but no real estate. Item. My will is that Thomas Wells my youngest son, shall quietly posses and enjoy for his use the parlour chamber of this house where now I dwell and have free liberty for fire wood until he marry and yt he shall have his diate and washing while he keeps here at the cost of my executor untill he come to the age of 22 years, 4 months and ten days. It. I give unto my son Thomas Wells all the bookes I bought for his use and my three phisicke bookes and the booke called the Orthodox Evangelist, the greate sermon booke, and Hyeling's Geogripha, and the little chest and table (he made) that stand in the hall chamber and my white box, and the chist plankes to make him a chist on, and the little iron canlestick, my white rule, my red pensheare, and my penknife and my sword and scabbitt and my firelock muskett wth a square barrell, and the mould, worme and scourer &c. Alsoe I give unto him the little bedstead in the hall chamber, and the little fetherbed therto belonging, and a paire of good sheets, and the red blankett and the blue rugg, and a good pillow and pillow beere. Allsoe I give unto my son Thomas my silver bowle, and one two-and-twenty shilling peece of gould, and I give unto him all my right and interest of the bond that is due unto me from goodman John Andrews of this towne, carpenter save only six pound ten shillings therof to my son Nath. Wells and wch makes the rest that he hath already had yr of twentye pounds, and this I give unto my son Thomas, towards his charges of his goeing to the colledge and for bookes and apparrell &c. or to put him to Mr. Allcocke or the like, and I give the new picktures viz: of the King and Queene and of the Five Sences... Allsoe my stufe clothes and a paire of my best stockings. Fynally I desire my liveing and faithfull friends Thomas Bishop, Senr and Mr. Thomas Andrews to be the overseers of this my last will and testament and to be the gardians of my sonn Thomas Wells dureing the time of his mynority and nonage to whom I give as a token of my respect and love ten shillings apeece. In wittness wherof and to wch I the above named Thomas Wells Senr have heer unto set my hand and seal dated the 31 of the fifth mo: comonly called July in the eighteenth yeare of the raigne of or Soveraigne Lord, Charles the Second by the grace of God King of England, Scotland, France and Ireland in the year of our Lord God one thousand six hundred sixty-six. There is a lengthy sketch of Thomas Wells of Ipswich in the book The Great Migration, Volume VII, pages 294 – 300. Generation 1: Thomas Wells, about 1605 in England and died 26 October 1666 in Ipswich, Massachusetts; married by 1636 to Abigail Warner, daughter of William Warner. She died 22 July 1671 in Ipswich. Seven children, and I descend from two daughters. Generation 2: Elizabeth Wells, born 31 July 1646 in Ipswich, Massachusetts, died 9 June 1731; married on 6 June 1668 to John Burnham, son of Thomas Burnham and Mary Lawrence. He was born in 1648 and died 12 January 1704 in the Chebacco Parish of Ipswich, Massachusetts. Nine children, and I descend from three sons. Generation 2: Abigail Wells, born about 1642, died 16 June 1677; married on 19 June 1661 in Ipswich to Nathaniel Treadwell, son of Thomas Treadwell. He was born 13 March 1637/8 in Ipswich, died 11 January 1726/7 in Ipswich, Massachusetts. Seven children. I took a trip through time with my Mom this week. No, we didn't have access to a DeLorean time machine, but while riding in my little Hyundai together on our way to Hamilton, Mom shared some great stories with me. We were on our way to Hamilton, Massachusetts to tour the archives at four star General George S. Patton’s estate (the World War II general). Mom grew up down the street from this estate, and had lots of memories of playing in and around the main house, barns and 500 acres of fields and woods. She had never been inside the main house, and now was her chance. It had been the residence of the Patton family from 1928 until 2012. Several years ago, Joanne Patton, the widow of Major General George S. Patton (the Vietnam era general) donated the main house and 27 acres of land to the town of Hamilton. It houses the Patton Family Collection, which is managed by Gordon College’s Institute for Public History. The current archivist of the Patton Homestead archives, Carol Mori, gave a great tour of the many artifacts, photographs, paintings, military memorabilia, books and documents under her care. This was a special series of tours available only for Wednesdays during the month of July 2014. This library was built as a first floor wing to the Homestead in the 1930s by General Patton and his wife Beatrice Ayer Patton for their retirement after World War II. As you all know, history intervened and General Patton was killed in a jeep accident in 1945. He never returned to Hamilton, Massachusetts to enjoy his new wing of the homestead. Can you find the 5 "George Smith Pattons" on this chart? but it is confusing because there were two General George Smith Pattons! Did you know there were five George Pattons? The first George Patton was a military officer for the Confederacy during the civil war. The second George Patton died young, but not before he fathered the George S. Patton who would become the four star general during World War II. The fourth George S. Patton was a major general during Vietnam. The fifth George Patton is still alive, but he was born mentally challenged and is living with a caretaker in Colorado. and seeing the barns and horses. She said it still looks exactly the same. My mom was thrilled to be inside the main house! Here she is examining military memorabilia. Mom used to peek in the windows as a child. Mom grew up playing with the children of the estate workers. She especially remembered the six children of the caretaker, who lived above the barn. Certain things in the yards of the estate were objects she remembered, like the cast iron jockey hitching post by the kitchen door. She remembered the cook in the kitchen wing giving them cookies, and her brothers camping out at the bottom of the meadow by the Ipswich River. One vivid memory she remembers was of peeking into the windows, because all the kids wanted to see General Patton’s pistol! In 1950 one of General Patton’s tanks from World War II was donated to the Town of Hamilton. That same year my grandfather, Stanley E. Allen, was a member of the recreation committee. The committee accepted the tank and placed it in the center of town at what is now called Patton Park. I remember playing at this playground as a kid, and being able to climb inside the tank to sit on the driver’s seat and peek out through the slits. Sometime in the 1970s the hatch to the tank was welded shut, but kids still climb all over the tank. My daughter climbing on the Patton tank in Hamilton's Patton Park 2004. I played on this tank, too, as a kid. the mascot of the Hamilton-Wenham regional school system. Another generation of kids learning about the Patton family. I wish I had a good reason to do some research here! GSP personal caputred weaons & permits"
was located below, but was destroyed in a fire that almost consumed both libraries. Green Meadows Farm, the current home of the Patton family (on land adjacent to the Patton Homestead) http://www.gmfarm.com/history at 656 Asbury Street, South Hamilton, Massachusetts.